Operated via an intuitive touch screen interface, the TMS-Pilot requires minimal operator training. Tests are performed at the touch of an icon and programs can be saved as favourites on the main screen for instant accessibility, using the TL-Touch software. With a plug & play design, the TMS-Pilot has a simple set up, allows load cells to be interchanged in seconds and accepts the majority of FTC's probes and fixtures. 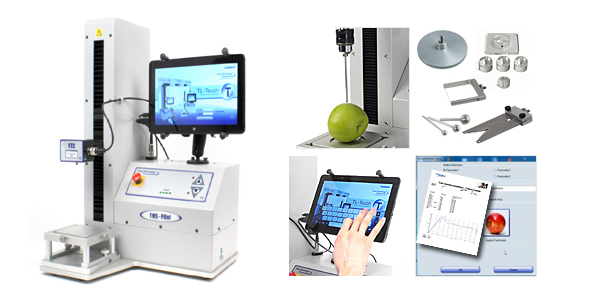 Designed with the budget-conscious in mind, the TMS-Pilot has the capabilities needed to perform basic texture testing of most food products, including: bakery, cereals, confections, snacks, dairy, fruits and vegetables, meats, gels and more.